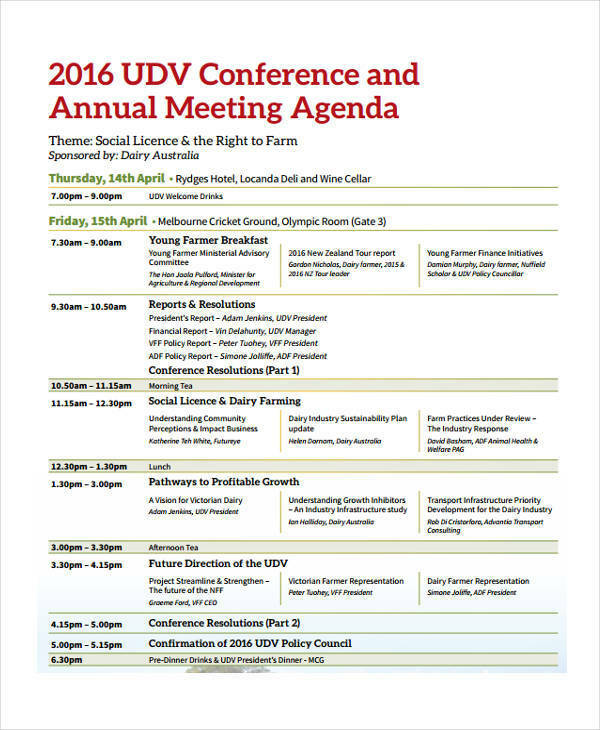 Looking for tips on how you can make your own conference agenda? Then, you have just landed on the right article! We are here to share with you a couple of tips and guidelines that can help you come up with your very own conference agenda. 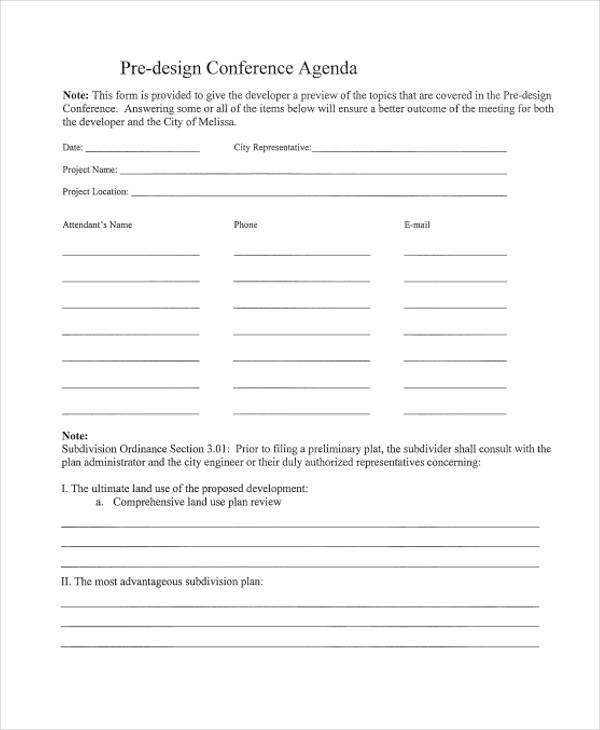 Are you looking for sample conference agenda templates? 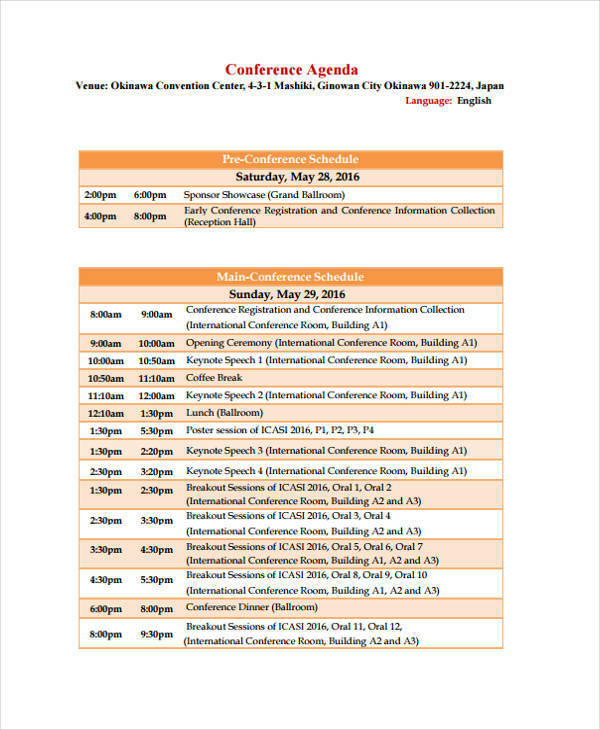 We also have some sample conference agenda templates to download directly from this article and you can definitely use as a reference for making your own conference agenda. 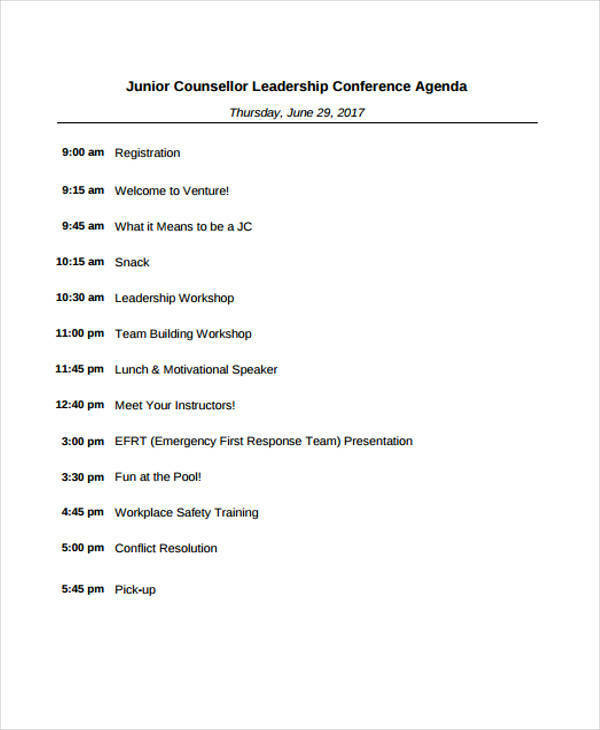 Just keep reading to get all the basic information that you need to know about conference agendas. Check them all out below. Sooner or later, you might be asked to help out with planning out how a conference in your company should go. 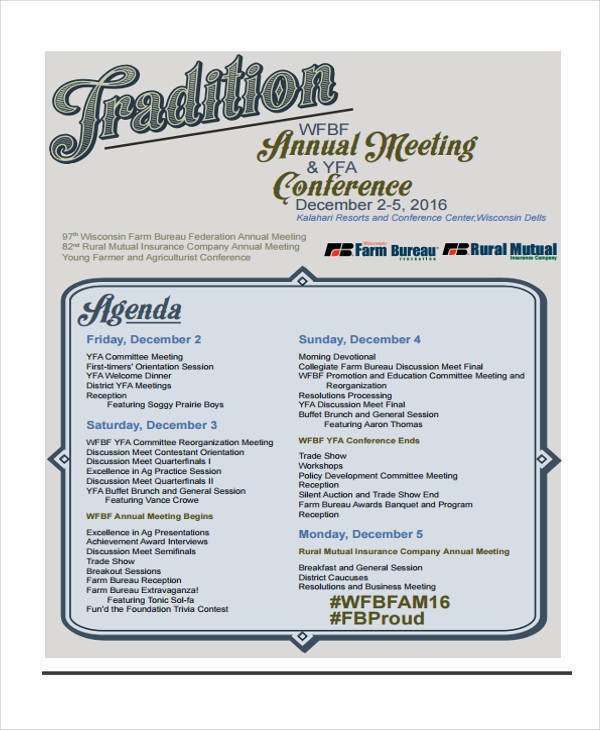 What will be discussed in during the conference can range from one simple topic to a couple of topics that might be a little complicated. To come up with a good conference agenda, we would like to give you a couple of tips that you might find helpful about how you can do so. 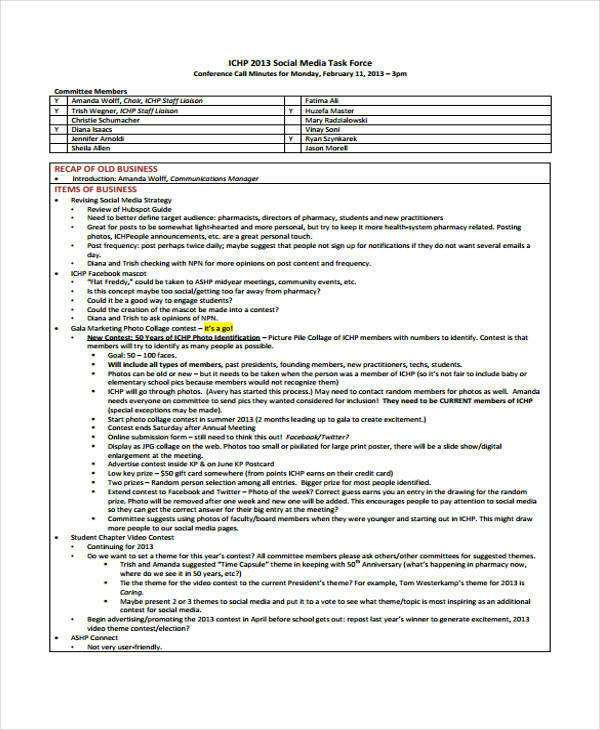 By following this guide, you will be able to make your very own sample conference agenda template that you can use over and over again for different types of conferences that you will be a part of. What should the participants learn from the conference? What sessions do you want to give importance to? What are the ideal start time and end time for the conference? How long is the amount of time that should be allocated for key speakers? These questions will help you create a conference agenda. Knowing the budget ahead of time is important. The budget can either be a fixed one or it can also be dependent on the attendance of the participants. If your case is based on the latter, you might want to ask for the participant turn out during the past two or three years to have a good estimate of the budget that needs to be allotted. If your budget is based on the former, it is likely that businesses have paid for the expenses of the speakers ahead of time. You may want to take a look at our budget sheet sample for ideas about how you can allocate your budget properly for your conference. Make sure that you also have a list of who the speakers for the conference as well as what they will be discussing during the conference. This way, you will know how you should arrange the topics for discussion. In between each speaker, you should make sure that you include a social activity and a couple of breaks in between to ensure that the participants will not be too overwhelmed with the topics being discussed. By knowing the speakers, topics, and activities for your conference agenda samples & templates , you will have a good idea if there is a need to trim down or increase the budget. 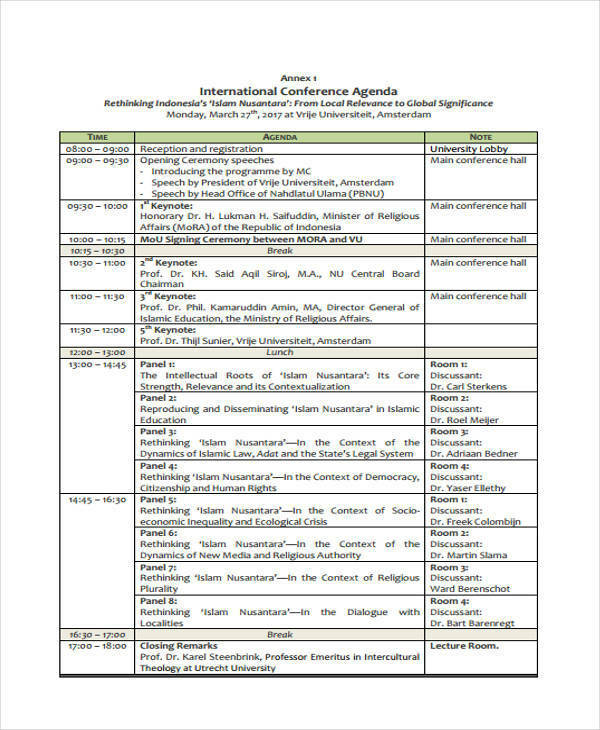 Now that you know what the activities and topics are as well as the speakers, it is time for you to start making the schedule for all the activities that are included in the conference. Make sure that you give each speaker a fair amount of time to properly discuss everything about the topic that they have. Also, you want to give ample amount of time for breaks for people to make important calls and the social activities as well. Take a look at our schedule templates for more ideas about how you can properly allocate time for the conference that you are planning. Once you have a schedule of activities for the conference, it is now time for you to start calculating the expenses that you have for the conference. This way, you will know how much to charge the participants for the conference or how much the business should allocate for the conference. you may also see Daily Agenda Sample. This will also give you a good idea about how much you will be spending for each of the speakers that you have for the conference and what perks you will be giving the speaker (free plane fare, free accommodation, meals, shuttle, or transport services, etc.) as this will matter during the calculation of your expenses. While it may not be your responsibility to do all of the budgeting for the conference, it will be a good idea to give the rest of the organizers a good estimate of the expenses. 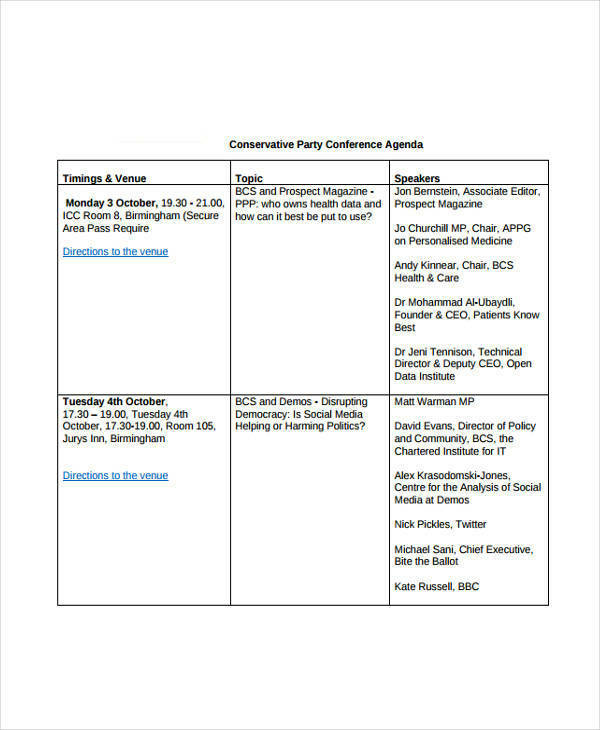 you may also see Meeting Agenda Samples. You may want to take a look at our expenses spreadsheet template for ideas on how you can easily calculate the expenses that you have for the upcoming conference. With the data that you have gathered from the previous years, start looking for a venue that can accommodate the expected number of participants during the conference. Call up these venues and take note of the available dates. Make sure that you choose venues that are in line with the theme that you have for the conference. 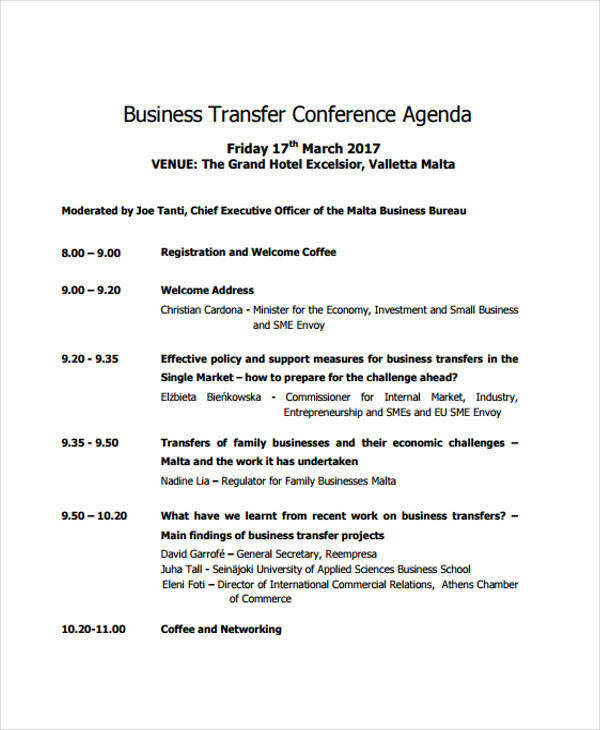 you may also see Business Meeting Agenda. 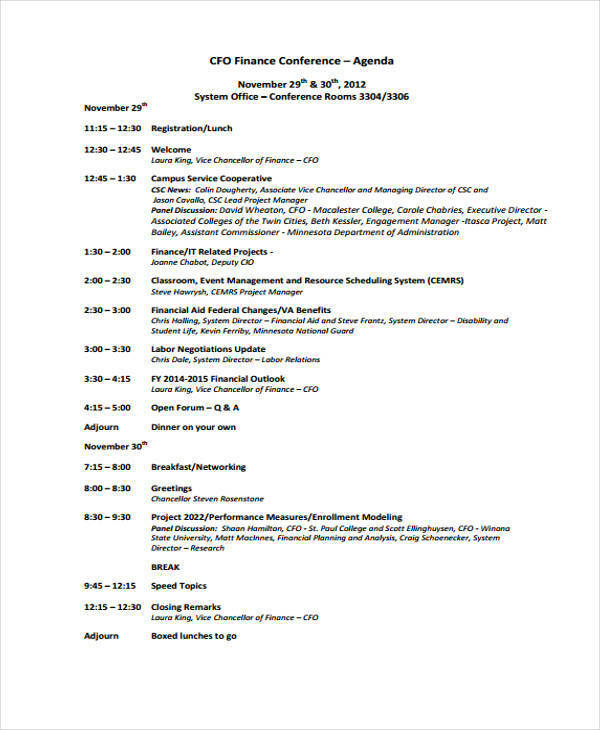 Once your conference agenda sample is already prepared, you want to present it to the organizers to let them have a good insight into what you have planned for the agenda. Make sure that you present it in advance to ensure that the organizers will have enough time to go through the whole agenda and give suggestions for edits should they have any. Once your proposed conference agenda has been approved, it is now time for you to book the venue on the available date that has been agreed upon by the organizers. Coming up with a conference agenda format may not be the easiest thing to do as there are many things that you would need to consider in order for you to come up with one that is effective and will make the experience for the participants a memorable and enjoyable one. The expected amount of budget that should be allocated for the conference and the calculated expenses. The topics that will be discussed. 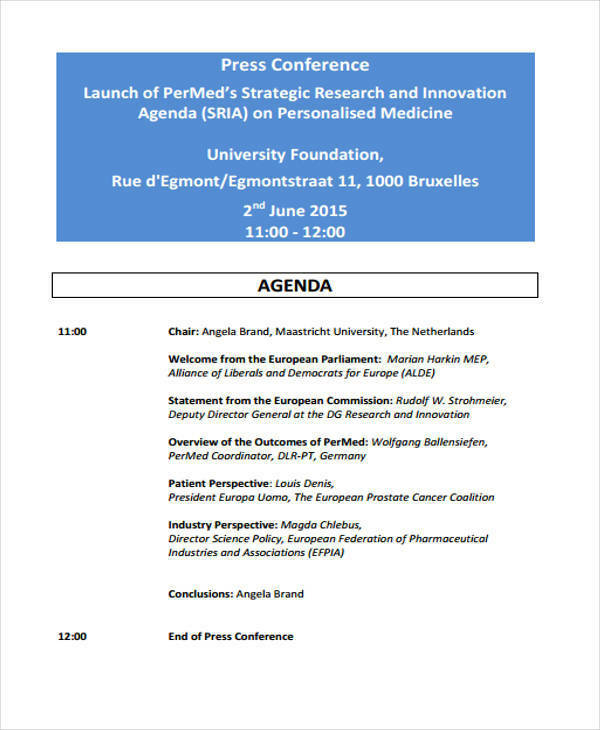 Who will be the speakers for the conference? The available venues and the available dates. Once you have all of that, you now have the basics that you would need for making a good conference agenda template. Now that you know all of these, it is now time for you to start coming up with your own killer conference agenda that will be deemed as effective and efficient. This way, you will be able to achieve everything that you need to achieve and you will also be able to do everything that needs to be done prior, during, and after the conference. Hopefully, this article has given you a ton of ideas about coming up with your own conference agenda. 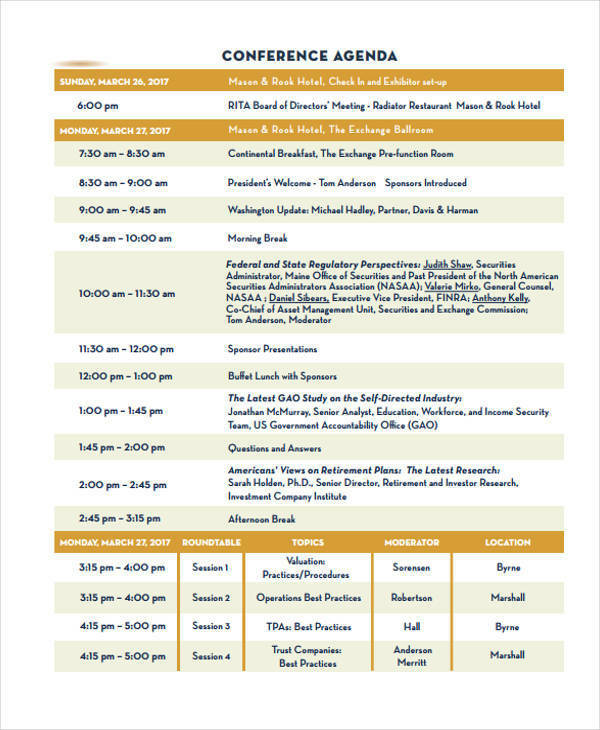 Do not forget to check out the sample agendas that we have included as these will serve as great references for your own conference agenda.